Despite their name, bedbugs have no sense of propriety. They don't always remain hidden away in the bed or even the bedroom. They are tiny, opportunistic creatures that migrate easily in luggage, purses, clothes, and fabrics of all kinds to anywhere they can find a food source. And that food source is you. If you suspect that your couch or favorite upholstered chair has hidden secrets, there are four steps you should take immediately to sleuth out the problematic insects and get rid of them. If you find bedbugs, be prepared to repeat the irradiation steps several times until your home is bedbug-free. Step One: How Do I Know if I Have Bedbugs in the Couch? 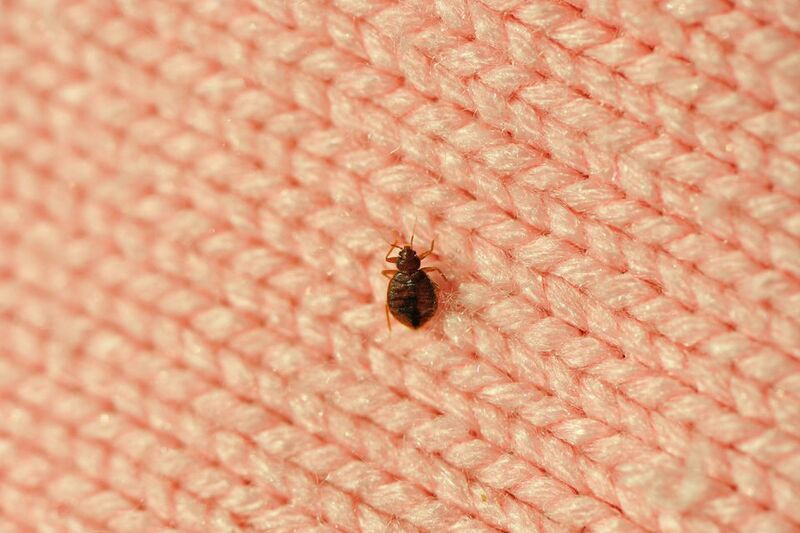 If you have noticed itchy welts on your skin, especially your back or the backs of your legs, or little specks of blood on your clothes or upholstery fabrics, then you probably have a bedbug infestation. The only way to know for sure is to do a thorough inspection. Now that you have all the tools gathered together, wrap the credit card with the double-sided tape. This will help you reach tight spaces like seams and capture any bedbug evidence. If you have a slipcover on the furniture, remove it and inspect it for bedbug activity. If you suspect a problem, put the slipcover in a heavy plastic bag to prevent spreading the insects to other pieces. Now remove each layer of cushions and inspect each piece as you remove it. Look at every seam, every edge, and every zipper using the sticky credit card and a flashlight. Move to the crevices along the frame of the couch or chair and turn it over so you can check underneath. Bedbugs tend to hide in dark spots and only come out to feed when humans are present. So, what did you find? If you see any of these five signs, you have bedbugs and treatment will be needed to get rid of the infestation. Bedbugs: Adult bedbugs are oval, flat, and a reddish brown. If they have recently fed on human blood, they will be rounded. Recently hatched bedbugs or nymphs are almost translucent and very, very small and hard to see. Bedbug eggs: Eggs are milky white and small than a grain of rice. You'll find them in dark crevices and cracks where they can remain undisturbed until the hatch. Dried Blood: If you see specks of fresh or dried blood on furniture fabrics, this is a possible indication that bedbugs have been active and feeding. Insect skins: Bedbugs shed their skins or exoskeleton at least five times as they move through the stages of maturity. These shed skins look almost identical to a live bed bug except the exoskeleton will be more translucent in appearance and will not be moving. Since shed skins don't decompose rapidly, they start to accumulate and that is usually what you'll see before you find the bugs. Excrement: Bedbug excrement or waste appears as black spots or thin black streaks. Now that you've confirmed the infestation, it's time to take action. First gather anything that is washable and toss it in the washer. A trip through the washer using hot water and then a tumble dry on high heat will kill all stages of bedbug development. For items that cannot go in the washer, start by vacuuming every surface and crevice. Don't forget to turn over the furniture to get to every surface. Use a vacuum with as much suction as possible and preferably one with a HEPA filter to capture as much residue as possible. Empty the bag or cup frequently into a heavy plastic bag that can be sealed and disposed of outside the home. Now that you have vacuumed each cushion and the frame of the upholstered furniture, there are several options to help insure that you've captured every bedbug. Cushions can be put in a large, sealable plastic bag and placed in direct sunlight until the temperature reaches 120 degrees F. The heat will kill all bedbug stages. Or, you can freeze the fabrics. If you have freezer space, put the plastic bag of fabric in a cold spot. Bedbugs cannot live at temperatures below 32 degrees F. for more than a few days. If you live where the weather is frigid, this is a good solution. Of course, the frame of the furniture cannot go in a plastic bag in the sun or freezer. It's time for steam that will kill bedbugs and their eggs. Steamer should be able to produce stem temperatures over 120 degrees F., have a large water container to sustain steam for a longer period, and have a pinpoint nozzle. Follow the instructions carefully for your steamer. To make the nozzle even more effective, cover the tip with a microfiber cloth and secure it to the wand with rubber bands. The cloth helps dissipate the pressure of the steam and helps increase the temperature at the tip of the nozzle. Guide the nozzle along every crack and crevice including seams and zippers on cushions. You should also steam all flat surfaces to kill any eggs, remove excrement stains, and disinfect fabrics. The fabric should be very damp but not soaking wet. It will probably take several hours for the furniture to dry. A fan can be used to circulate the air to speed the drying process but direct heat should not be used because it can be a fire hazard. Since bedbugs can linger in carpets, curtains, and even wallpaper seams, chemical treatment with insecticides is almost always needed to rid a home of an infestation. The best choice is a residual spray that can be applied to offer several weeks of protection.Unfortunately, bedbugs can live for up to one year without feeding on a human. Now that you've vacuumed, steamed, and sprayed, one more way to prevent bed bugs from reaching the comfy depths of furniture is to place plastic bedbug interceptors under each leg of the furniture. These are basically multi-walled plastic cups with a slick coating that prevent bedbugs from crawling up the legs of the furniture. They are readily available in stores and online. They are also a good indicator of how severe the infestation may be because you can see how many you capture each day. It's a good idea to keep the interceptors in place for up to one year.